Indeed it is. 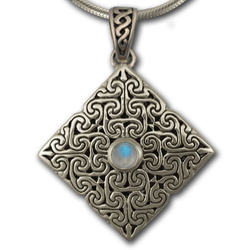 This beautiful Sterling Silver pendant is a complicated maze-work of Grecian designs and the Celtic Knot traditions. This pendant combines those influences into a diamond shaped form with intricate twists and swirls on a blackened background to show off all the silverwork. Centered in this lovely complication is a misty blue-eyed moonstone cabochon. Flange-style top attachment is decorated with a twisted rope design against black. Ready for your choice of chain length (chain sold separately).